Somewhere beyond the farthest star, in a forever-age of steel and stone, a famous young hero wields his fantastic powers to defend a domain of monsters, mystery, and vengeful dark forces! This is the time of… LAZERBOY! A guardian of all that is green and good! Friend and protector to animals everywhere! A defender of peace and justice in a savage realm of beauty and danger! She’s that femme-fury of freedom… WILDGIRL! Even as his countless victories are celebrated, a new threat emerges to challenge heroic Lazerboy! The evil Ro-Busto wields the power of the Medallion of Might, and will use it to claim the title of… I dunno, Really Strong Guy, I guess. Look, it doesn’t matter because this comic isn’t about logical progression of character. It’s about really cool characters like Lazerboy and Ro-Busto doing outrageous things in the name of Right and Might respectively. Meanwhile, Wildgirl has discovered a dastardly plot to capture all of the creatures of her beloved forest. The evil Sini-Starr of the Argoz Galactic Empire has turned the innocent animals to stone, to be transported to his Master as additions to his collection. Aided by her winged companion, the noble Venture, can Wildgirl stand up to the technological power of this alien fiend? Fate transforms a dying martial artist’s mangled form into that of a near-invulnerable super-warrior… a MAN WHO CANNOT DIE! Unscrupulously made a fugitive of justice, Elias Bronson has relocated to Grandway City and uses his newfound powers and unequalled mastery of hand-to-hand combat to Serve, Protect, and Defend those in need! Elias Bronson is… THE STREET FIGHTING MAN! With Satanic forces encroaching on the good people of Grandway City, there is no one who can stem the tide of evil. No one but nigh invulnerable martial arts master Elias Bronson, also known as (see above in all caps…). When the violence is kicked into high gear by the arrival of King Kong Duke, the Street Fighting Man will need all of his skill to stand against him and save the neighborhood. The criminal mastermind known as Babyhead (seriously, and he’s creepy as hell…) has assembled a group of like-minded masters of mayhem and menace the likes of which the world has never seen. What will we do when Actiongirl, Riff Raff, 3-Face, and Mew-Man (think rejected He-Man action figure) join forces? Will the Triumphanteers stand firm to hold back the tide of Evil? Will Space Cowboy ever get his hat back? Will Mega-Girl be able to study for her upcoming exams? Most importantly, who were those two fellas in the park, looking suspiciously like a tribute to all that was ever great and good in the world of comicbook creation? And gadzooks, if I keep coming up with all of these questions, how will I ever get this review finished? These are some of the greatest throwback, retro styled comics I’ve read since “retro comics” were just comics. Now for those of you who might have gone back and tried reading some of the classic comics of yesteryear, I understand your doubts. All feelings of fond nostalgia aside, the old books we grew up on can be tough to read these days. The beauty of these books is that Jeff Knott & Derek Jessome have managed to pay respects to the old stories and their writing, but it’s done with a knowing nod & a wink. The books are in the spirit of the classic comics from the seventies, but they’re written with a wry sense of humor that’s fully aware of the corniness of it all. Likewise with the art, also handled very ably by Knott & Jessome, and in three different artistic styles reflecting what the individual title is giving the nod to. 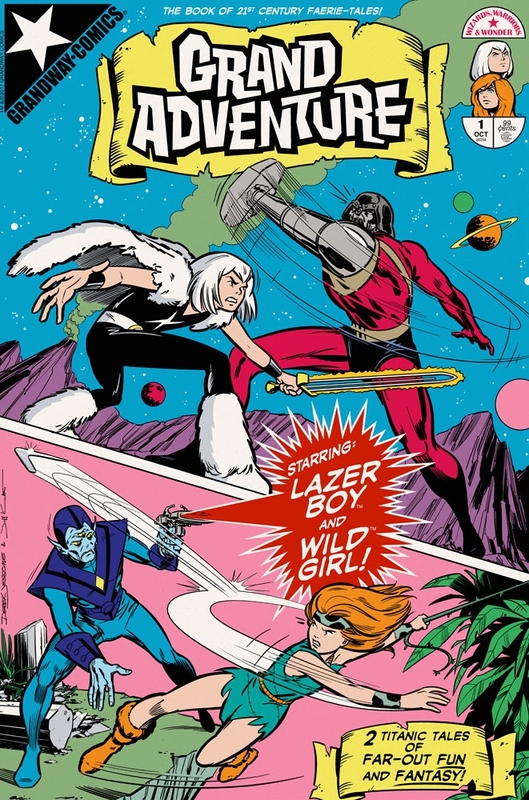 Grand Adventure, featuring Lazerboy and Wildgirl, is done in the style of the old Hanna Barbera adventure cartoons like Johnny Quest, Space Ghost, and The Herculoids. 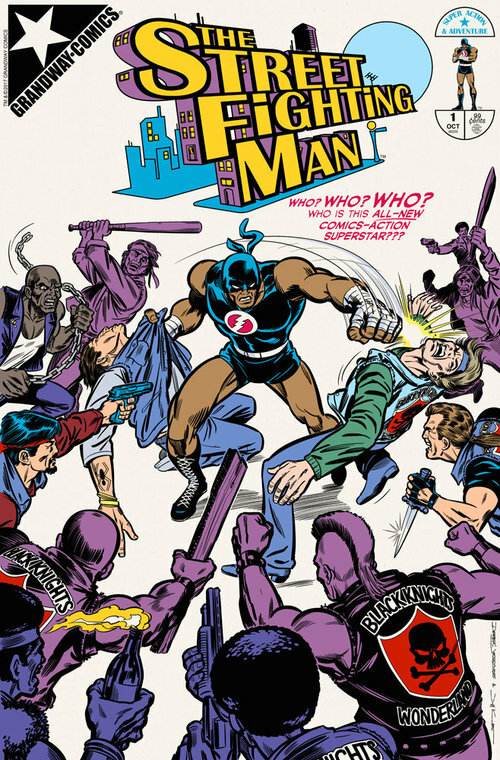 Street Fighting Man looks like it could have been drawn by John Romita back in the 70’s, as the style is very reminiscent of the old Luke Cage/Iron Fist comics. 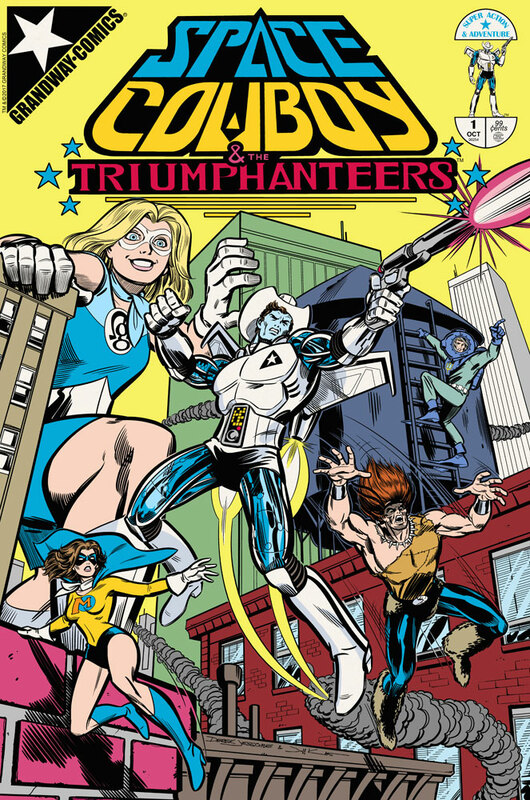 Finally, Space Cowboy and the Triumphanteers is the team book that has all of the elements of the original Avengers. 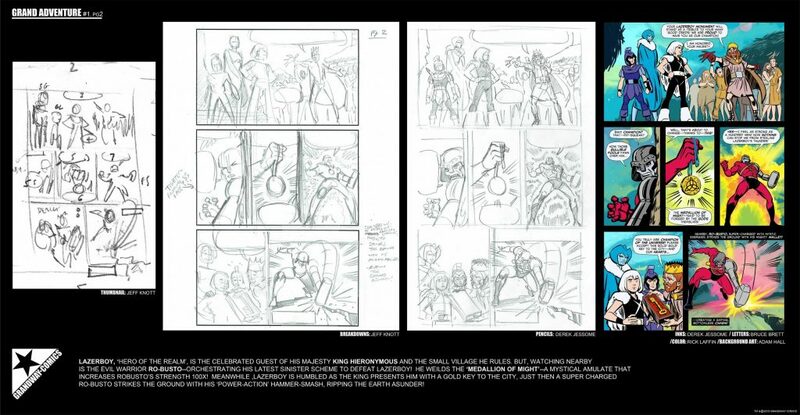 Keep an eye out for the Easter Eggs hidden around the pages of this one… most notably the two gentlemen sitting in the park going over a drawing pad, the spitting images of the comicbook legends who started it all. I can’t find anything that I didn’t like about these books. 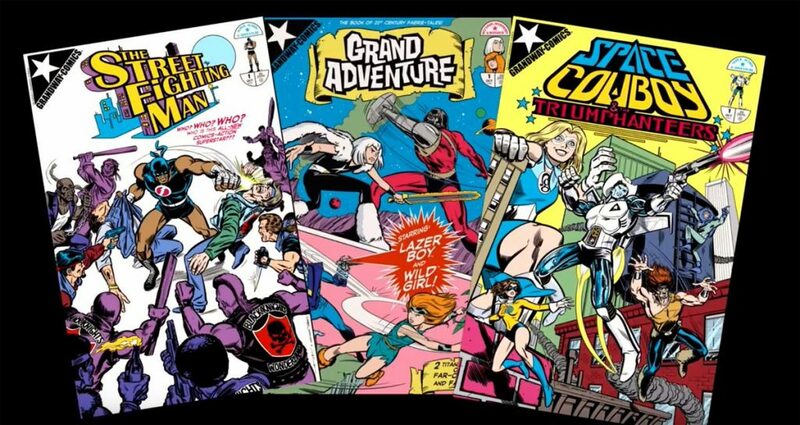 They’re just what you’d be looking for, so long as what you’re looking for are some quality throwback comics that hit all of the nostalgic notes you could possibly be looking for. Check the Grandway web page and look around. I’m pretty sure there’s gonna be something there that’ll catch your eye.